산조란 장구반주에 맞추어 다른 악기를 독주형태로 연주하는 것을 말하며, 4∼6개의 악장을 구분하여 느린 장단에서 빠른 장단 순서로 연주한다. 거문고산조는 거문고로 연주하는 민속 기악 독주곡이다. 고구려의 왕산악이 처음 만들었다고 하는 거문고는 우리 민족 고유의 현악기로 ‘현금(玄琴)’이라고도 한다. 길이 1.5m, 폭 25㎝ 정도 되는 나무통에 명주실로 꼰 6개의 줄을 매어 연주하는 악기이다. 거문고 머리를 무릎에 놓고 왼손가락으로 괘(줄받침)를 짚어 운율을 맞추며 오른손으로 가느다란 대나무로 만든 술대를 쥐고 줄을 쳐서 소리를 낸다. 거문고산조는 고종 33년(1896) 백낙준에 의해 처음으로 연주되었으나, 일부층에 의해 거문고의 품위를 손상시킨다는 비난을 받아 빛을 보지 못하다가 개화기에 들어서 인정받기 시작하였다. 처음에는 선율이나 리듬이 단조로운 가락이었으나 점차 절묘하고 복잡한 리듬이 첨가되었다. 느린 장단인 진양조, 보통 빠른 중모리, 좀 빠른 중중모리, 절름거리는 5박인 엇모리, 빠른 장단인 자진모리 등 5개의 장단으로 구성되어 있다. 선율을 보면 모든 악장의 처음 부분이나 중간에 잠깐 나오는 담담하고 꿋꿋한 느낌의 우조와 흔히 끝에 나오는 슬프고 부드럽고 애절한 느낌의 계면조로 짜여 있다. 거문고산조는 수수하면서도 웅장하고 막힘이 없는 남성적인 절제미가 돋보이는 음악으로, 우조와 계면조를 섞은 빠르고 느린 리듬이 조이고 풀고 하면서 희노애락의 감정을 잘 표현하고 있다. 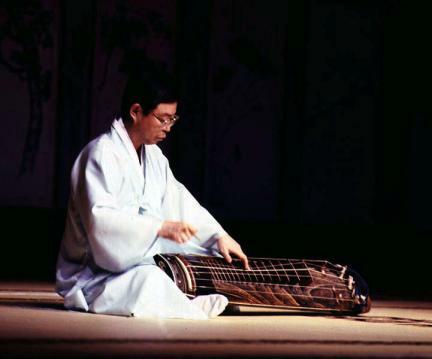 Sanjo refers to the playing of an instrument solo to the accompaniment of janggo (hourglass-shaped drum), moving from slow to fast rhythm in four to six movements. 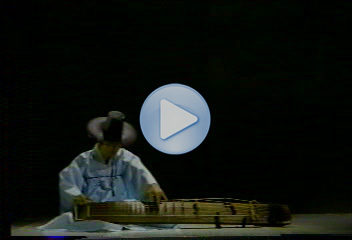 Geomungo Sanjo is Korean instrumental folk music played solo with geomungo (six-stringed zither). 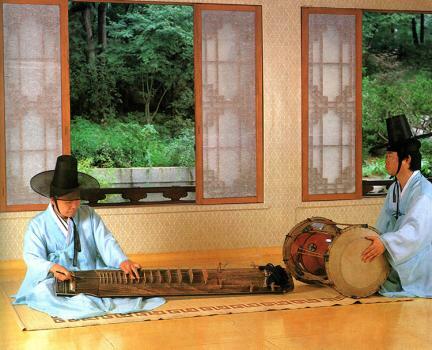 Geomungo, which is also called hyeongeum (literally “black zither”), is said to have been made by Wang San-ak during the Goguryeo Period (circa 37 BC - 668 AD). It has six silk strings made of twisted silk thread tied to a wooden body 1.5m long and 25cm wide. 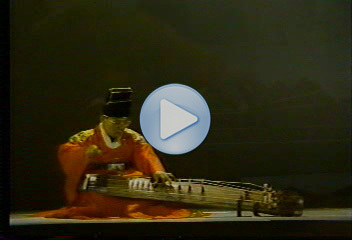 A player sitting on the floor plays it while it is placed on his/her lap the way one plays a guitar, with the left hand tuning melody with string support called “gwae” and the right hand striking strings with thin bamboo (“suldae”). 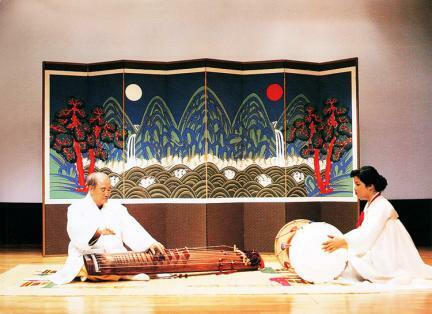 Geomungo Sanjo was first played by Baek Nak-jun in 1896 (33rd year of Emperor Gojong’s reign), but some people said that it was music that degraded the gracefulness of geomungo. Thus, it was only years later that a particular type of geomungo playing was accepted by majority of the people. At first, it was composed of monotonous melodies or rhythms; gradually, however, exquisite and complicated rhythms were added. Geomungo Sanjo has five rhythms: jinyangjo (slow), jungmori (moderate), jungjungmori (moderately fast), eonmori (irregular), and jajinmori (fast). Overall, its melodies are made up of ujo (calm and steadfast feeling), which appears in the first and middle parts of each movement, and gyemyeonjo (sad, soft, and plaintive feeling), which appears mostly at the end of each movement. Geomungo Sanjo is a piece of music containing a sense of subdued masculinity, featuring moderate yet grand and unrestricted feeling; its rhythms, slow and fast, express the sense of delight, anger, sorrow, and joy well.